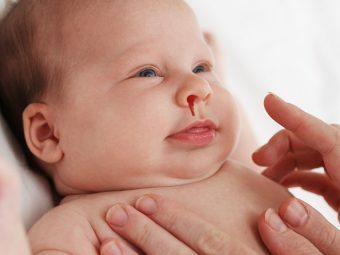 What are the symptoms of an allergy in the baby? How are allergies in babies diagnosed? How are allergies in babies treated? How can parents manage their baby’s allergies? 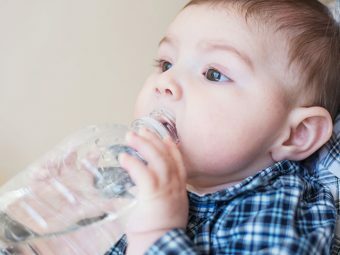 How to prevent allergies in babies? 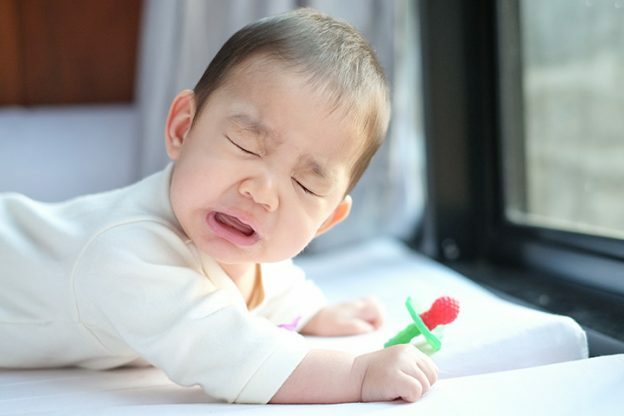 Allergies are common among babies. An infant can be allergic to a lot of things that are primarily food and airborne substances. But what other infantile allergies exist? Here is a MomJunction article with all the information about allergies in babies, and how parents should tackle any allergic reactions. An allergy is an exaggerated reaction of the immune system to an allergen. Usually, the immune system produces antibodies to protect the body from foreign pathogens such as bacteria, viruses, and fungi. But in some cases, the immune system uses the antibodies to attack a relatively mild foreign body such as a protein from a food item. This results in damage and problems to the body rather than in eliminating the foreign substance. Allergies are thus problems with the immune system (1). Faulty genes: If one of the baby’s parents has allergies, chances are the infant will develop the allergy too. The probability is higher if both the parents have allergies. Genes alone seldom lead to the onset of allergy. Genetics may work in tandem with other factors to trigger allergies. Environmental factors: There are a host of environmental factors such as pollutants, chemicals, pollen, and dust particles in the air that could trigger an allergic reaction. Some experts even hypothesize that living in an overly clean and hygienic surrounding may also make the immune system sensitive to potential allergens. Medicine and other substances: Some medications can have compounds that can coerce the immune system to send out faulty responses, such as an allergic reaction. Other substances such as latex have specific compounds that can interfere with the standard functions of the immune system and trigger an allergic reaction. Infections: Pathogens can elicit a strong reaction from the immune system, sometimes in the form of a persistent immune response leading to an allergy. For instance, an infection by the respiratory syncytial virus (RSV) can increase the risk of asthma even after the infection is cured (3). Several respiratory viral infections have been linked to the development of allergies later in life. While the exact cause is not known, this could be due to the damage caused by the pathogen to the immune system. Simultaneous exposure of the immune system to a pathogen and a potential allergen could also be the reason. 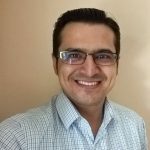 Pollen, insect, biological sources allergy – Pollen, grass, dander, fur, molds, fungus, dust mites, droppings of insects, venom from insects or other animals, insect bites. A baby can also be allergic to regular domestic animals like dogs and cats. Babies exposed to any of the triggers mentioned above can develop an allergic reaction. 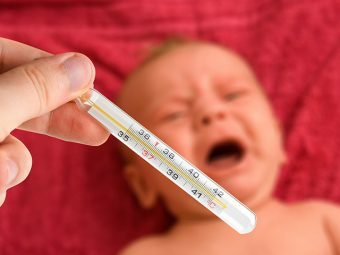 What Are The Symptoms Of An Allergy In Baby? The baby will develop cold-like symptoms such as a runny, stuffy nose and sneezing. Shortness of breath and trouble getting sufficient air into their lungs is a sign of allergy. It will almost be like asthma, and the infant will display gasp and wheeze while breathing. Shortness of breath is quite likely to be accompanied by a persistent cough. Skin hives look like small, irregular bumps, with a reddish to a pinkish color. Hives may also appear as a cluster of fine, red rashes on various parts of the body. Nausea, vomiting, and severe abdominal cramps. Swelling of the skin around the mouth and eyelids. When the above symptoms are severe, the situation is called an anaphylactic shock. 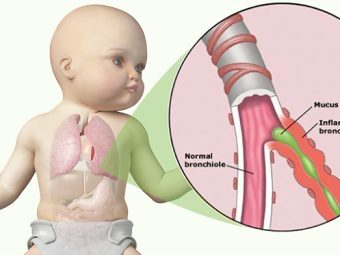 In addition to these symptoms, the baby may also suffer severe swelling of throat muscles that impede breathing and a rapid drop in blood pressure (9). Anaphylactic shock is a medical emergency and needs immediate medical attention. Blood test: The test checks for the presence of antibodies that are markers of an allergic reaction. When drawn soon after an anaphylactic shock or a bout of allergy symptoms, the blood will be packed with such antibodies. Skin prick test: There are two types of skin prick tests viz. percutaneous and intradermal skin tests. The percutaneous test is performed by injecting a suspected allergen into the top layer of the skin using a thin needle. If the person is allergic, then they display the symptoms almost immediately. This test is performed only on infants older than six months. The alternative is an intradermal test where the suspected allergen is injected further deeper into the skin. This test may not be recommended for infants since it has the potential of causing an anaphylactic shock among sensitive individuals. Food elimination test: If the doctor suspects a food item to be responsible for food allergy, then they will eliminate a food item from the baby’s diet. If the infant no longer displays any symptoms of allergy ever, then it can be concluded that the discontinued food was the allergen. Antihistamines: Antihistamines are a class of medicines used in reducing the inflammation and irritation of the skin that one experiences during an allergic reaction (14). They eventually reduce the body’s susceptibility to breaking out into the hives and rashes when exposed to allergens. Corticosteroids: Corticosteroids contain anti-inflammatory properties similar to antihistamines, but they also have immunosuppressive characteristics that can help subdue the overactive immune system, which is characteristic of allergies. These compounds can be more effective than an equivalent quantity of antihistamine (15) (16). Immunotherapy: It is the most elaborate treatment method for allergies and may be applicable only in scenarios when allergies become an impediment for living a healthy life. Immunotherapy uses an interplay of complex compounds to alter the immune system and end allergies. An individual referred to immunotherapy needs to undergo a thorough analysis by the doctor to determine the precise allergens. The doctor then prescribes injectable medications and dissolvable tablets. This treatment method is intricate and thus may be used as a last resort. You may have to carry a self-administering epinephrine auto-injection that helps rapidly subdue the symptoms of an anaphylactic shock. The treatment of allergy is often slow and may take several months to years. In any case, treatment can only ease the symptoms in the long-term and not cure or eliminate the allergy completely (17). Management of allergies by parents can play a significant role in preventing allergic reactions. Avoid the airborne allergen: If your baby is prone to allergy due to pollen, then avoid taking them outdoors, to places like a garden, during the spring season. Avoid flowering plants at home and prevent exposure to airborne allergens such as dust, dust mites, dander from animals, dust from the droppings of birds, etc., which can trigger an allergic reaction. Install, an air purifier at home to keep out potential allergens. Stay away from food allergens: Avoid foods that you know can cause allergy to your babies. Look for allergy warning on the labels of packaged food items in case your baby is a solid food eater. Look at replacements for dairy, gluten, nuts and such and double-check ingredients before purchasing ready-to-eat foods. Keep surroundings clean: Some allergens lurk around the corner. You could have tiny dust mites and bugs crawling around in your home without your knowledge. If you suspect it to be the case, then get the house cleaned by professionals to get rid of critters that can pose as potential allergens. If you have pets at home, then keep a check at the bedding and other soft items that could trap fur. Check a vaccine’s contents before immunization: Some vaccines may contain animal proteins that could act as a potential allergen. For example, yellow fever and the influenza vaccine contain egg proteins that may trigger an allergic reaction (18). Discuss with your doctor for alternatives to prevent adverse reactions to a vaccine. Make relevant changes in baby’s lifestyle: Some allergies require you to make significant changes in the baby’s life, to prevent allergy symptoms and also mitigate the risk of an anaphylactic shock. If your baby has eczema, then dress in clothes that cause less skin irritation. If the baby has asthma, then use a cool-mist humidifier at home to make breathing easier. Parents must also carry an epinephrine auto-injector for emergencies when the baby encounters an anaphylactic shock. Making changes in your baby’s lifestyle can significantly help reduce triggers and let the baby thrive. Introduce foods gradually: Most potential allergenic foods are only given to the baby after the age of 12 months (21). Add foods, one at a time and in small quantities, to the baby’s diet and increase the portion size gradually (22). It will help the body adapt to the food item better while also helping the parents accurately pinpoint the specific food item responsible for food allergy. Prevent exposure to smoke: Early exposure to tobacco smoke and pollutants can increase the chances of the baby developing asthma (23). So stay away from tobacco smoke, including second-hand smoke, right after you conceive. Exposure to tobacco during pregnancy is a noted cause of respiratory problems and allergies later in the baby’s life. Breastfeed the baby: There has been a link between prolonged breastfeeding and the reduction in the risk of development of allergies (24). Breast milk is rich in antibodies that help attune the baby’s immune system better, making the body less vulnerable to allergies. Also, there is no evidence suggesting that the mother’s diet during lactation can make the infant susceptible to allergies (25). Stay alert to early signs of allergy: Staying alert to early symptoms of allergy can help prevent repeated exposure to a potential allergen. It eventually prevents repeated episodes of allergy and significantly brings down the chance of the baby suffering an anaphylactic shock. If you suspect your baby is displaying symptoms of allergy towards food or airborne items, avoid exposing them to those triggers. Allergies in babies can be nasty and a cause of worry for the parents. But some care and precautions are perhaps all you need to avoid making an allergy complicated. If you suspect something wrong, then do not hesitate to take your baby to a doctor. Allergies seldom become a barrier for a baby’s healthy growth if you learn to manage them properly. Have something to share about allergies in babies? Do let us know in the comment section below. 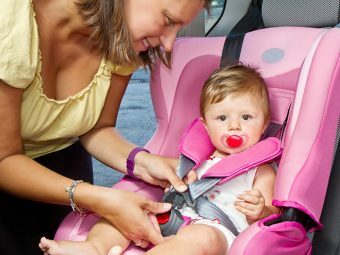 How Long Should Your Baby Be In A Rear-Facing Car Seat?